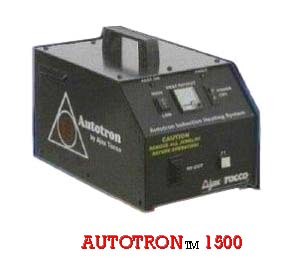 The Autotron 1500 is a lightweight air cooled Induction heating source. When used with one of several heating tips, it produces flameless heat within metal objects, such as body panels, nuts bolts and window channels. It will not heat non-metal objects such as glass, paint or plastics. Imagine flameless heat within seconds after the application of the heating tip. It allows technicians to perform damage free repairs of bonded panels, moldings, graphics, window removal, metal heating, paint curing and many more tasks, many which were impossible with flames or other heat sources. and pre heat cold panels! The AutotronTM1500 saves you time, saves you money, and at the same time improves quality and safety! The Autotron 1500 Pro Package comes with the The Glass Pro Inductor, the Body Pro Inductor and the Bolt Pro Inductor which allows you to maintain top effeiceny in your shop and at the same time producing more profits and in a safer manner. Removing glass without scheduling a glass technician reduces down time and also keeps more profit in your shop while reducing sublet costs. Saves money by reduce the need to purchase rubber wheels/adhesives. Side molding adhesives can be reused, saving materials and replacement labor.